Fabulous easy crafts for kids which make learning fun with original homeschool activity ideas and bonus free origami paper. You'll find fun activities for kids to suit all ages. 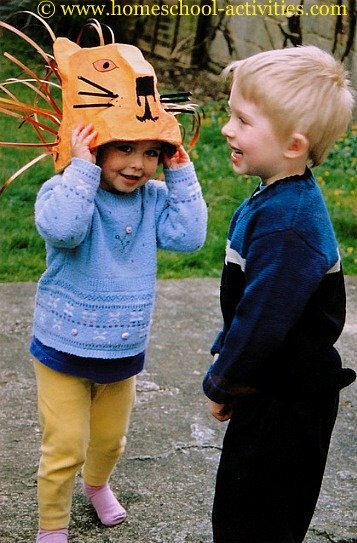 These are kids crafts with a difference! 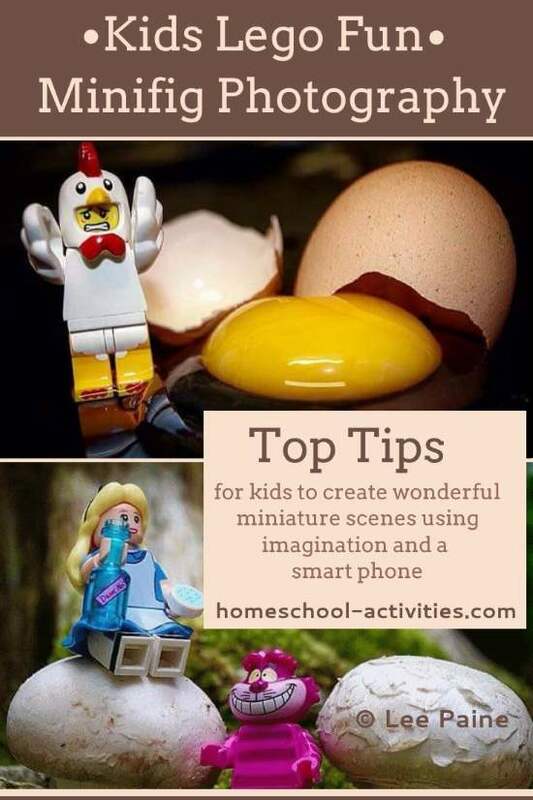 I have picked out the best homeschool activities which lead to all sorts of learning ideas. 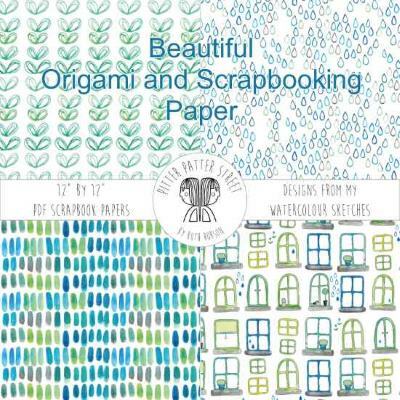 SIX beautiful sheets of free origami paper with different designs to get you off to a great start with easy crafts for kids! Specially made by my homeschool friend Ruth Robson. 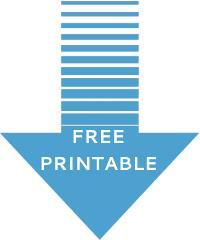 These are for your private use and not for commercial purposes. You can see more of Ruth Robson's beautiful work here. 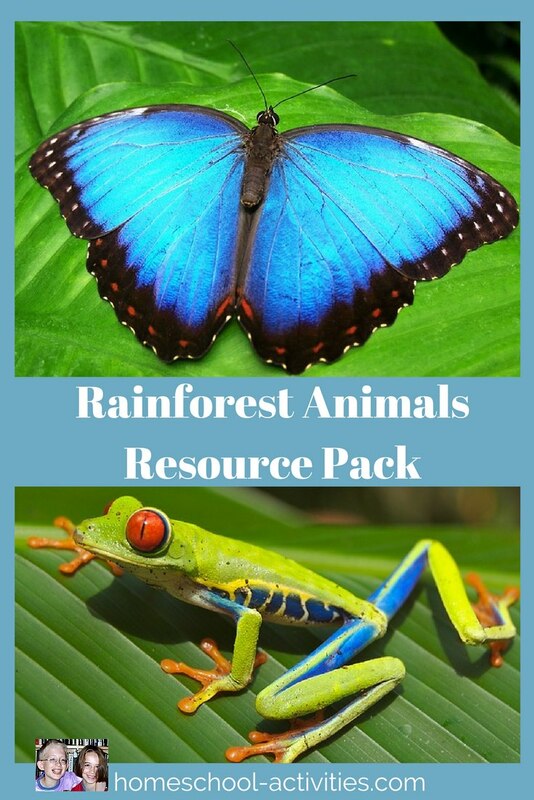 Come and enjoy free kids crafts in the rainforest with this free resource pack. Make a ring-tailed lemur and a homeschool bromeliad pool complete with baby tadpoles as part of our homeschool science rainforest activities. Pebbles are one of the loveliest easy crafts for kids. 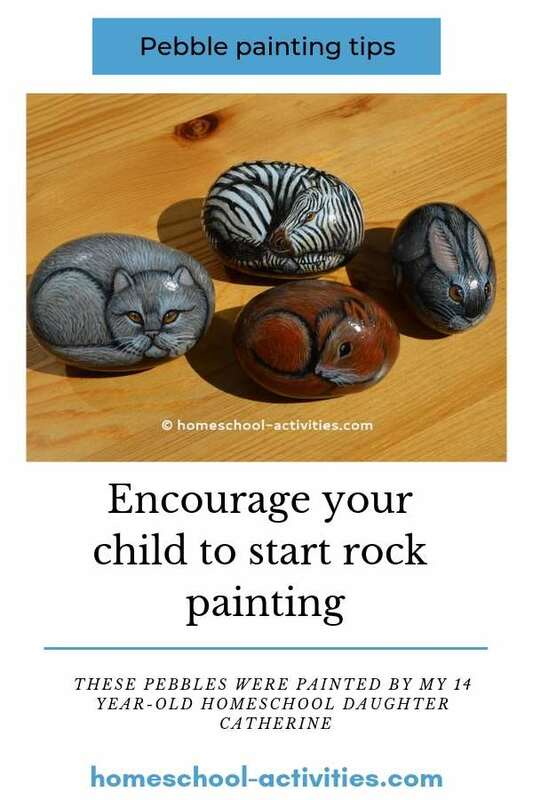 We share rock painting tips and show how joining the Kindness Rocks project brings happiness as your child's pebble travels the world. 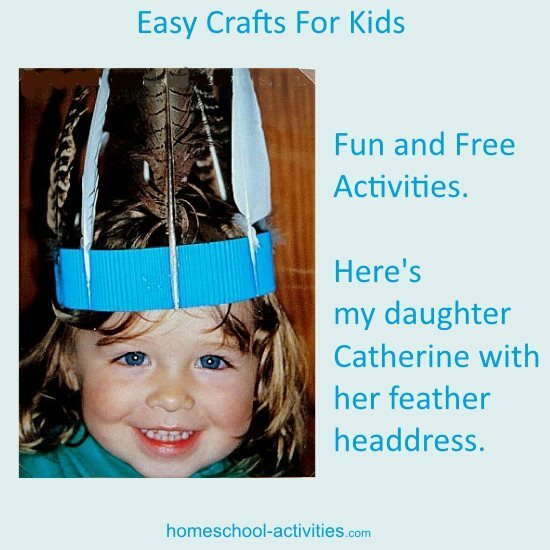 Going on a nature walk collecting bird feathers is free and making a Plains Indian headdress is so easy even a toddler can help! 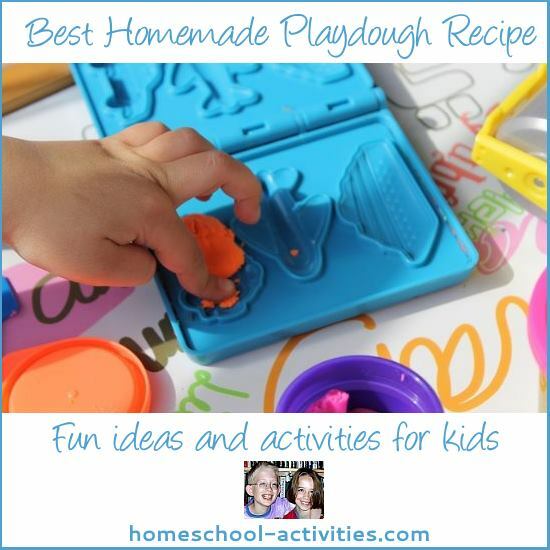 Try adding glitter and sequins to our easy homeschool play dough recipe. Our homemade recipe is great for having fun with easy crafts for kids and you can even make it smell nice by adding peppermint or vanilla. Making an animal mask is one of those fun activities for kids which is also really easy because all you need is a paper plate. Come and see how in our homeschooling crafts for kids. 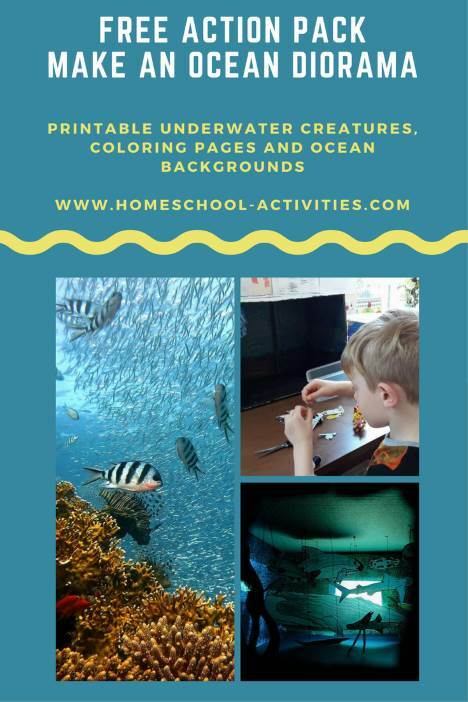 Seashells and sequins all come in for easy crafts for kids as you join our homeschooling Ocean Creatures activities. 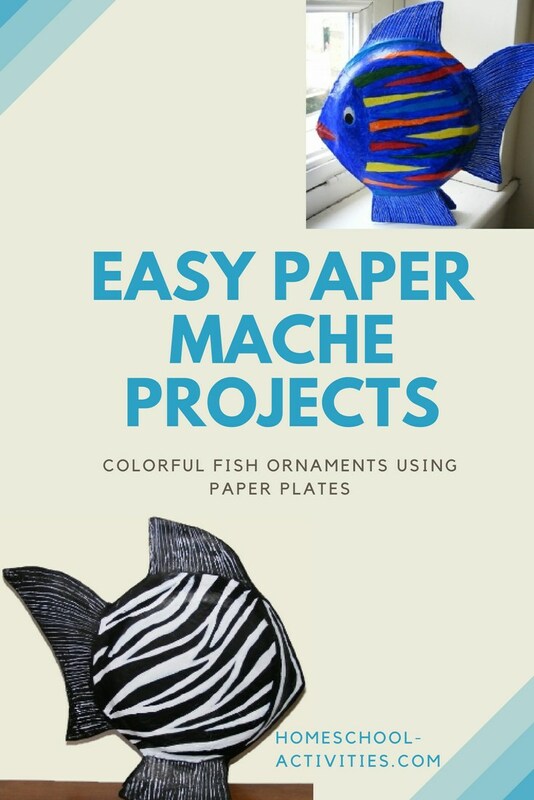 Fun paper mache ideas for kids with these fantastic fish ornaments - all you need is two paper plates. You'll learn more about how to make pictures come alive using easy crafts for kids. All you need is some cardboard and a few pins! 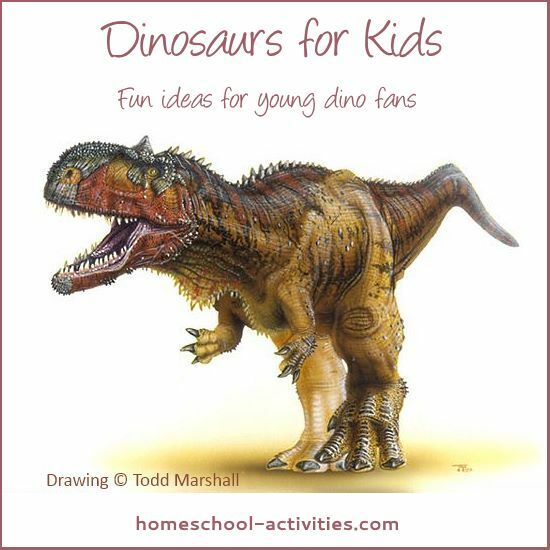 Fun dinosaur activities, including hatching your own baby dinosaur from a balloon. 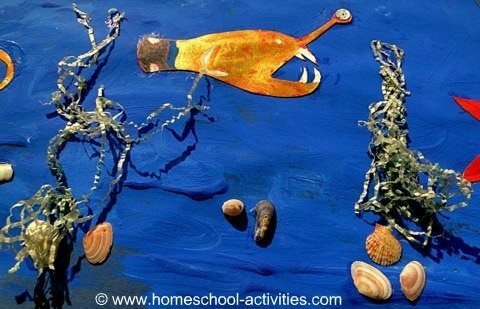 Enjoy free kids crafts up to and including High School level with our homeschool ocean diorama. Have fun turning a shoe box into your own secret undersea world. Easy crafts for kids get more fun when we teach you our patent homeschooling paper mache recipe. Aside from enjoying the lovely squidgy feeling on their fingers, your children can use paper mache for all sorts of free crafts for kids. We take you through the easy steps to build our homeschooling Mustafa lion animal mask. 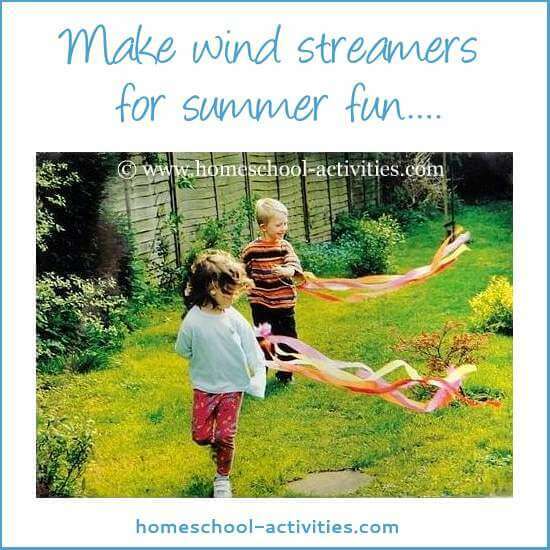 Our colorful crepe kids wind streamers are really easy to make, cheap, fun and great to play outdoors. As you can see, William and Catherine loved running along with the streamer flying out behind and they're perfect for having fun at festivals. See how you can use your minifigs to create set-ups and have lots of lego fun! Needle felting is one of those fun easy crafts. 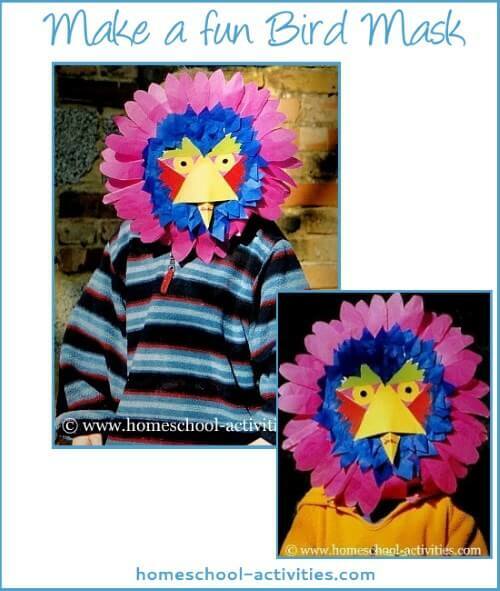 Come and see how to make these cute homeschool birds. 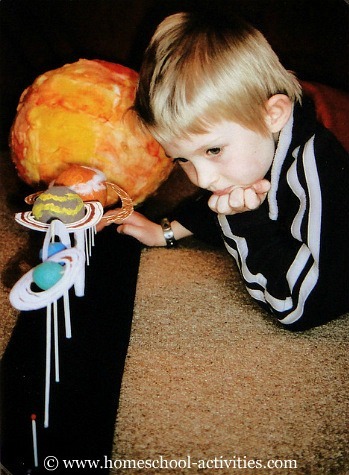 Why not build a solar system model? Planets are easy if you make them from modeling clay and you can add to the homeschooling fun by flicking sun spots on a cotton wool sun! 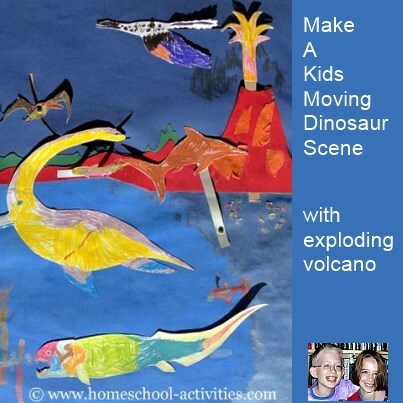 Use your craft skills to make dinosaurs come alive in our homeschooling dinosaurs activities. With paper fold-outs, tabs and pipe cleaners we'll show you the homeschooling easy tips to make fun crafts for kids exciting. 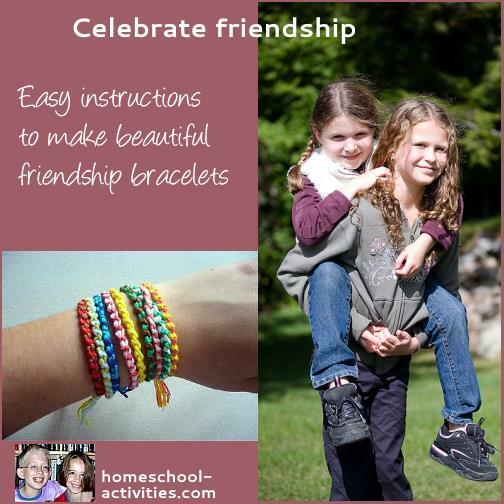 Here our homeschool friend Sandy show you how to make friendship bracelets. 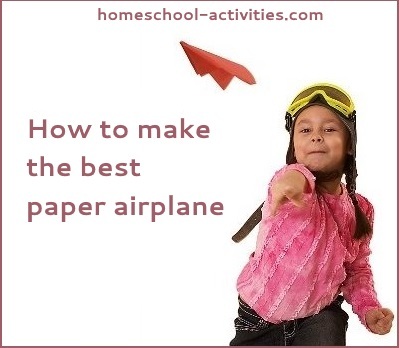 Paper planes have to be one of the most popular easy crafts for kids. 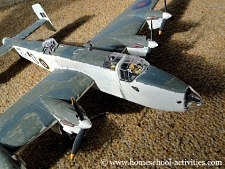 Unfortunately, not all of them fly brilliantly, so I thought I'd ask our homeschooling expert (my son William) to show you his favorite model plane which is easy to make and great to fly. 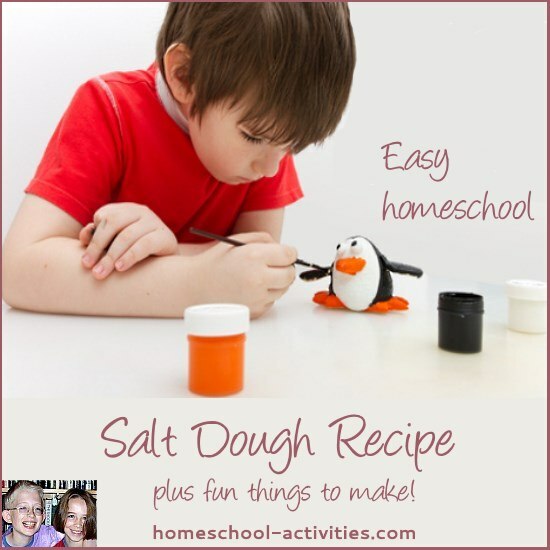 More fun ideas for free crafts in our page on how to make our easy homeschooling salt dough recipe. OK I've cheated! This craft activity is not free, but it is fun and lots of children learn an amazing number of craft skills from doing them. I've given you our easy homeschooling guide to getting the most out of plastic model airplane kits. Dragon crafts come into their own at night with this magical homeschool paper lantern. 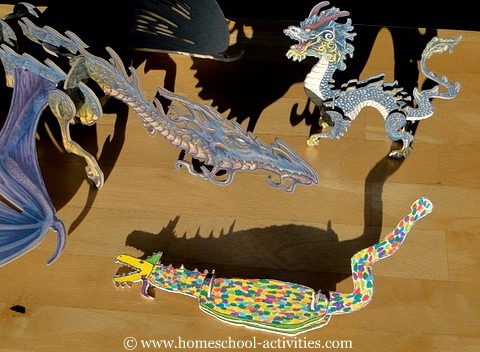 Catherine is going to show you how to make a homeschool model dragon perfect for making a dragon mobile in our page on dragon crafts. Please SHARE your favorite kids crafts HERE and see what others have contributed, including pages on how to make a paper tepee. Finally, come and learn how to build a robot for free using household junk! See if you can spot the air freshener head and fearsome plastic fork teeth on this T-Wrecks. 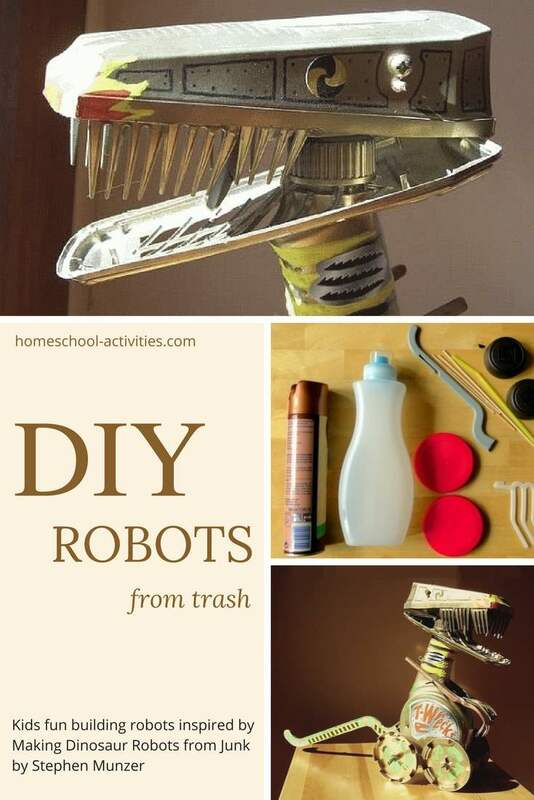 You'll find lots of homeschooling suggestions for building free cool robots just by raiding the trash can. Find more fun kids craft activities like making leaf prints and cooking homeschool chocolate fudge, in our page on craft ideas. There's no doubt our easy crafts for kids activities will stretch your children's talents and throw in lots of learning at the same time! Most of all, we guarantee you'll have fun.